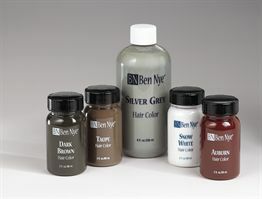 Ben Nye, Sr. pioneered Silver Grey Hair Color and it still has the right balance between silver and grey, appearing realistic for stage and film. Apply with a toothbrush and style easily without stiffness. Avoid use on chemically treated hair. Protect costumes during application. (Expect 3-10 applications per ounce.) • 2 fl. oz./59 ml.